The Clarity X was designed primarily for the video post-production market, but this sophisticated monitor control system has potential applications elsewhere. 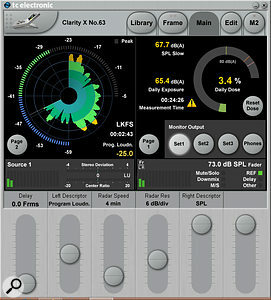 It supports stereo as standard (5.1 and 7.1 formats are cost options), and provides all the usual monitoring tools — SPL reference calibration, dim/cut/solo, source and speaker level offsets, time-delay compensation, polarity inversion, bass management and so on — while simultaneously interacting with a comprehensive suite of meters running on the user’s computer. The hardware comprises a 1U rackmount chassis, a remote control, a calibrated reference mic and various cables, including AES3 and analogue DB25 break-out cables, a LAN cable and mains lead. A quick-start guide is supplied but you need to download the comprehensive PDF manual. The rack unit’s front panel is blank, save for a ventilation grille, a few status LEDs and a reset button. The rear panel features an IEC AC mains inlet (100-240 V) for the universal power supply, whose cooling-fan noise is of a level similar to that of a typical computer), and three RJ45 sockets: two for 100Mbps network connections and one for the remote control. There’s an XLR input for the calibration mic, and a 15-pin D-sub GPIO connector, of which I found no details in the manual. Audio inputs are via two AES59-standard 25-pin D-sub sockets, which accept up to 16 channels of AES3 for the main monitoring inputs and provide 16 AES3 outputs. A Toslink socket is configurable by software to accept eight channels of ADAT or two of S/PDIF. A 3.5mm mini-jack, which I’d rather had appeared (or been duplicated) on the front, caters for an unbalanced stereo input source (maximum level +5dBu). There’s also an option for MADI input, comprising two BNC (input and thru) connectors, for up to 64 more channels. An internal, software-controlled signal router allows the input signals to be fed to monitoring and metering channels, and individual sources can feed multiple destinations. The Clarity X’s D-A converters, which feed the analogue monitoring outputs, run on a very low-jitter clocking system derived from TC’s flagship System 6000 hardware, and can clock from an internal crystal or any of the digital inputs. There’s no dedicated wordclock input and only 44.1, 48 and (following a recent firmware update) 96 kHz sample rates are supported. My bench tests gave D-A converter AES17 dynamic-range measurements of 111dB A-weighted (about 10dB below the very best converters), and THD+N at just over 100dB A-weighted. All of the connections are on the rear of the rackmount unit — even the headphones and aux input. The outputs comprise another 25-way AES59 D-sub, this time carrying eight ground-sensing balanced analogue outputs, notionally for the speaker feeds (maximum level +12dBu), plus a quarter-inch TRS headphone socket which, again, I’d have liked to access on the front panel. The internal speaker-monitoring signals are organised as four nominal speaker ‘Sets’, with Sets 1 and 2 supporting 2.0, 2.1, 2.2, 5.1, 5.2 and 7.1. Set 3 only supports the three stereo formats, while Set 4 is dedicated to the stereo headphones output. The first three Set signals can be routed to the analogue or AES3 outputs, and multiple speaker sets can be routed to the same outputs, allowing monitors to be used in different configurations. There’s no Toslink output port and no provision to output via MADI. The Clarity X is configured almost entirely over Ethernet, using its ICON software for Windows and OS X, but TC’s impressive ICON controller (available separately) can also be used. In either case, several compatible TC Electronic devices can be controlled from the single interface. The rack unit comes configured to a network IP address of 192.168.1.nn, the last two digits being the last two of the serial number. This will be compatible with most simple network installations, but if the network IP addresses aren’t compatible you’re thrown into a convoluted setup process. I know this because my work network runs on an incompatible address: even with the Clarity X plugged in, the ICON software couldn’t see the network. A real ‘Catch 22’! Thankfully, the hardware can be connected directly to an Ethernet-equipped laptop: set the laptop’s IP address to be compatible and the software will find it, making it possible to reconfigure the IP settings for a different network. Though tedious and frustrating, the manual does at least explain the procedure clearly and, once installed and communicating correctly, the software provides a wealth of configuration, operational and metering options. Tabs across the top of the software access different primary functions, with buttons down the side for related menu pages. The setup parameters relevant to each menu page are displayed in boxes, and highlighting a box allows one of six faders at the bottom to adjust the parameters. Configuring the entire system (routing input signals, deciding on speaker configurations, routing the output destinations, calibrating delays, bass management, EQ and reference SPLs, and setting up the various meter options) takes a while, but it’s logical and instinctive. The options are extremely comprehensive, and reference to the PDF manual is essential to fully appreciate the possibilities and ramifications. Space is too limited here to go into depth, but even the headphone output can be configured for four different impedance ranges, ensuring proper load-matching and a correct dynamic range and noise floor. (There are also presets for a limited range of headphone models.) Speaker SPL calibration can be aligned to one of three reference levels (SMPTE RP200 at 85dBC, ATSC A85 at 82dBC, or R128 at 73dBC), and the level trimming for individual speakers is performed manually. The hardware remote has 12 buttons and a volume knob. The bottom six buttons serve as individual speaker mutes/solos, while four of the top six can be user-defined. The first selects the preset calibrated reference-monitoring level, while the third activates dim/cut. However, the Alt button can be programmed to select a different speaker set, and the F1-3 buttons to select different reference levels, reset the loudness or dose meters, audition the (configurable) down-mix, mono or side signals, polarity-reverse specified speakers, or activate the ‘noise floor zoom’ mode. This last option introduces up to 70dB of extra output gain, raising the noise floor to aid detection and resolution of any low-level nasties. Thankfully, in case some normal-level signal is inadvertently passed through during this test, a hard limiter is activated at -20dBFS, to protect ears and speakers. 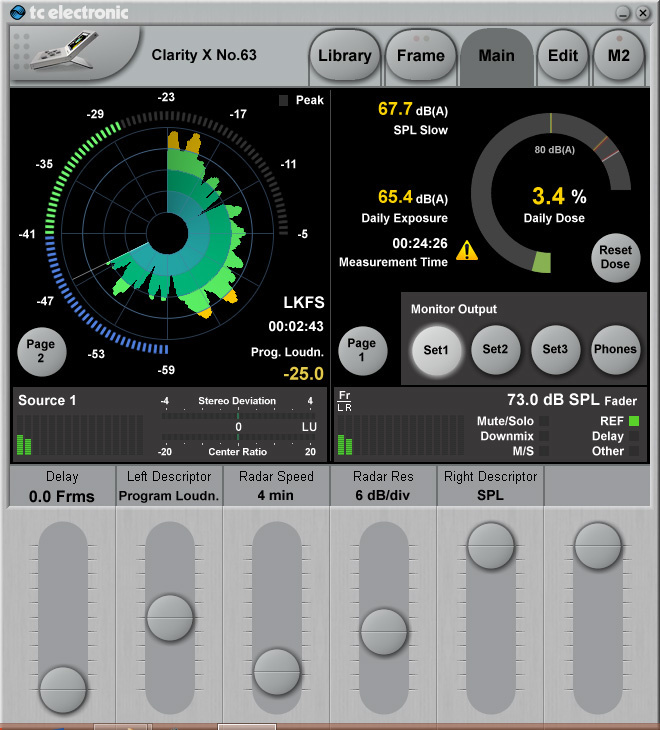 The system includes TC’s now-familiar software loudness metering, and offers useful figures for professional environments, such as loudness exposure dosage. TC’s LM8 radar meter provides now-familiar loudness and loudness-history displays, and the Clarity X actually has two of these, M1 and M2, each of which features automatic data logging — files may be exported for external analysis. M1 always reflects what’s being auditioned, while M2 has its own input routing options to enable metering of a separate source. Integrated in the meter displays are true-peak warnings and numerical readouts of other selectable parameters, such as loudness range, integrated loudness and so on. For the M1 display, a set of bar-graph meters under the radar display the input levels, and horizontal meters can be called upon to show stereo deviation and centre-ratio. A second menu page reveals a complete set of loudness parameters, a reset button and a peak-level bar-graph. Alongside the main radar meter is a second window with a graphical representation of the currently selected speaker set, with more bar-graphs showing output levels and indicators for monitoring modes like down-mix, reference levels, M-S and so on. 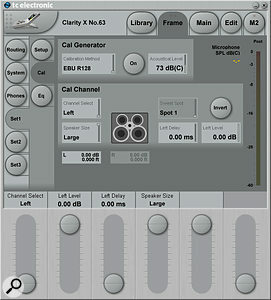 The second display page option calls up the operator’s noise exposure dosage, and current SPL. 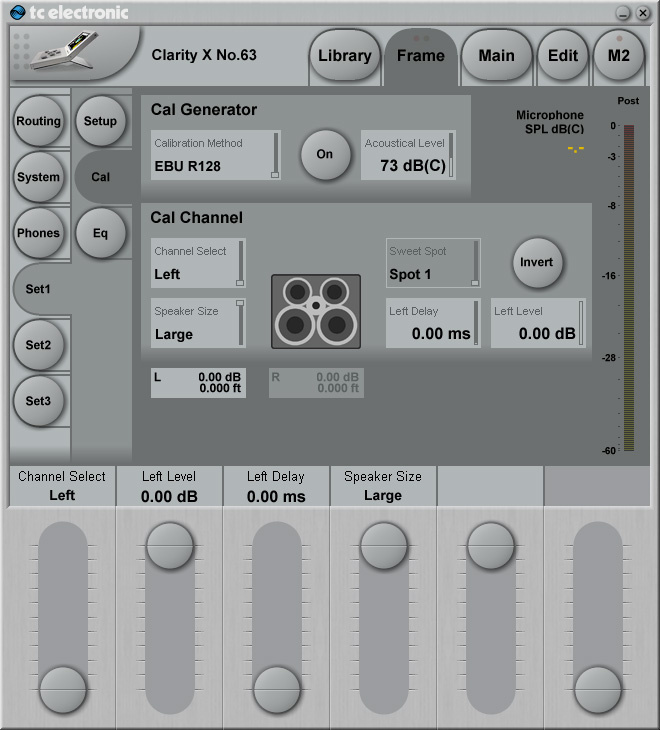 The software can also be used with the measurement mic to calibrate the monitoring system. 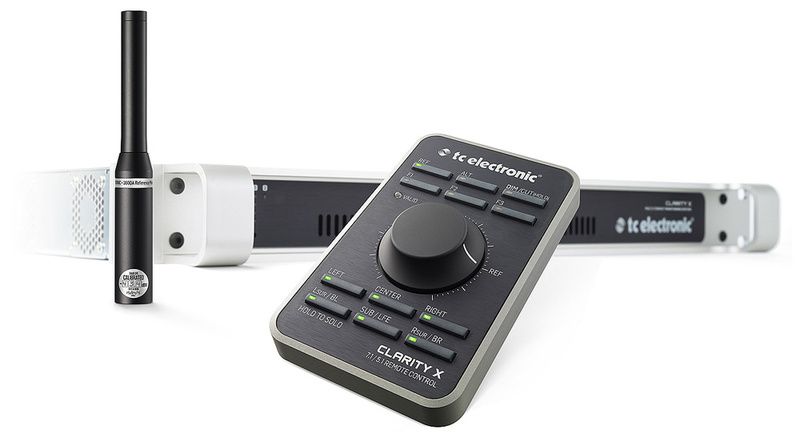 The Clarity X is a very capable integrated monitor controller and metering system. It ticks a lot of important boxes for its primary professional TV and film post-production market, with its integrated loudness metering and the unique SPL exposure logging going a long way to justifying its professional price. The integrated SPL and user noise-exposure monitoring will undoubtedly appeal to employers concerned about health and safety legislation, and the system’s elegant radar meters, centre-channel balance and configurable down-mix options will appeal to sound mixers. The converters, though outperformed by class leaders such as Benchmark’s DAC2-HGC and the Lynx Hilo, perform well. The hardware remote is ideal for instant control of key functions, while the ICON software remote control provides elegant system configuration and metering. Some of the design decisions initially surprised me, such as connectors for portable replay devices and headphones being on the rear, and the inclusion of a fan. However, given the intended market, the hardware will have been designed for installation in a machine room, with the headphone and MP3 player connections wired back to the control room. In short, then, there are some very clever ideas and technologies in the Clarity X, and hopefully these will trickle down to products which are better suited and more affordable for the project-studio market. There’s no direct competitor that integrates all this functionality so seamlessly, but there are plenty of capable multi-channel monitor controllers — the Audient ASP510, Coleman SR5.1 and SR7.1, Crane Song Avocet, Crookwood M1, Dangerous Music Monitor ST/SR, and SPL SMC2489, for example — and there’s plenty of choice when it comes to hardware and software loudness meters too. Remote control and calibration mic. Comprehensive input and output routing. D-A performance could be improved. This comprehensive remote-controlled monitor controller, with loudness metering and noise-exposure dose monitoring, is ideally suited for TV and film post-production. Starts at £2599 including VAT, with additional software licenses required for surround-sound functionality. Starts at $4200, with additional software licenses required for surround-sound functionality.